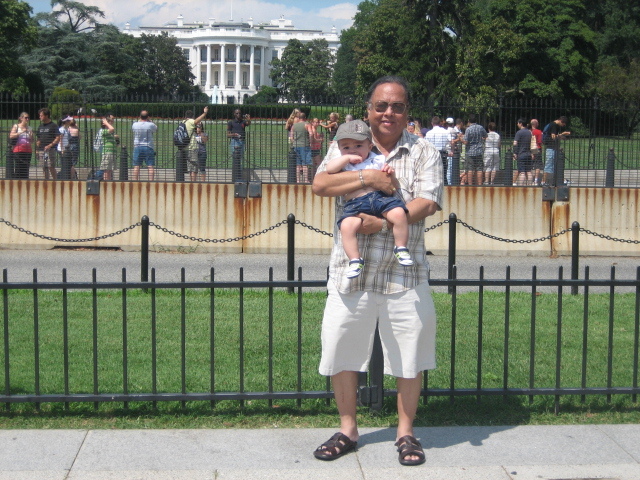 As I promised my good friend Monching, I’ll write about my memorable experience as regards my visits to different tourist attractions and historic landmarks in U.S. cities before my apo-stolic mission here in Fort Wayne, Indiana would end and prior to my return trip to the Philippines on Sept. 2, Wednesday, next week. “Tempus fugit,” yes, how time flies! I didn’t realize that my stay here would be that long (about six months since my arrival on March 24). As a holder of a ten-year multiple entry visitor visa, I am only entitled to a maximum stay of six motnhs unless extended by the U.S. immigration authorities. But I didn’t bother anymore to request for extension since I have so many pending works to complete back home regarding my early retirement after I turned dual citizen (Filipino citizen and senior citizen) during my birthday on May 18 which, incidentally, coincided with the late Pope John Paul the 2nd’s. This diversion, in fact, of burning the wires and sending emails as well as reading the national and local news back home (thanks to the internet and modern telecommunication technology) has kept me always abreast of the developments in our country and has made me less homesick, let alone made my stay here a lot more enjoyable and pleasurable. Aside from Chicago which topped my visits, perhaps, due to the proximity to our place (only more than three hours by long drive and where not a few of my relatives are residing), I’ve gone on brief sorties to Missouri passing by Illinois and Iowa and, of late, Pittsburgh, Wahington D.C.,(where the White House and Capitol Hill are located) Maryland, and Niagara Falls, (in Buffalo, New York side) again all by long drive. I was, particularly, interested in Niagara Falls not because of its being a tourism jewel but, due to the nature of my previous jobs in the National Power Corporation (Napocor) and, recently in the National Transmission Corporation (TransCo). Unknown, perhaps, to many, Niagara Falls is being harnessed for hydro-power generation that provide not only cheap and clean source of electricity for Canada but also to some parts of the U.S. I was also gifted by my daughter Michelle and son-in-law Jojo as a reward for my volunteer service (yes, gratis et amore) with two roundtrip plane tickets to Boston which is so rich with historic landmarks and tourist attractions and where I saw the magnificent summer houses of America’s old super-rich like the Vanderbilts and Astors, among others, in Newport, Rhode island when Bill Gates was still unheard of and the JFK Library and Museum. Finally, the last leg of my weekend visits was to Florida which is famousI for Disneyworld (more than 14,000 acres in land area) that I toured and its beautiful beaches. We motored to Sun Villa Drive in Vero Beach where I had a late lunch with my cousin and her hubby, Dr. and Mrs. Gemma Indolos-Mendoza. In all these two visits to Boston, my former colleagues in the Cebu media Ed Recla and his family and Balt Quinain, Jr. and his wife. Dr. Regina Pongos played gracious hosts just to make my weekend jaunts very enjoyable and memorable. I was scouring the web looking for some news from Danao when I came across this website. Ever since, every now and then I would visit this website for news update. I truly admire you guys for the noble undertaking you have done in helping our poor kababayans in Danao. Let me first introduce myself. I hail from Bali-ang, Danao city. I had my elementary education in Bali-ang under the tutelage of Mr. Catalino Ramos. I went to DNVHS in Sabang for my secondary education in which Mrs. Rose Canga was our nurse at that time. How time flew so fast, I guess Candy was one of the children she frequently brought along to school. We graduated on March 1972 after which Martial Law was declared by following September. Because there was no “paltik” on the early years of Martial Law, I was then forced to try my luck in Mindanao where most of my relatives in my mother’s side resided. While I was still in college in Cebu, I only visited Baliang and Danao once in a while. Some 4 years back, together with my whole family, we migrated to Ontario, Canada. Reading some stories and crossing some familiar names in this website would bring some fond memories of Danao. I would say I had one of my best memories during my high school days in Danao which I would forever treasure in my life. HOPE YOU ALL THE BEST IN YOUR UNDERTAKING. MAY GOD BLESS US ALL. Mernamie ‘Verna’ Castardo-Cunamay, a DAUSA Member, back from tending horrifically wounded soldiers in a frontline Afghanistan field hospital, relates to dausa.org her story and experiences while working for five months in Afghanistan. I volunteered to enlist in the military service despite the good pay I was getting as a licensed Registered Nurse in Florida and California. It just hit me one day that I should join the U.S. Air Force, do my share providing the best nursing care, that I can possibly perform for our soldiers in the battlefield. It’s no different from a successful attorney or businessman, leaving behind wealth and possessions, to become a priest or a monk. My husband was initially shocked and reluctant letting me go but he also felt and understood that it was some kind of a divine calling and that no- thing could have prevented me from going. 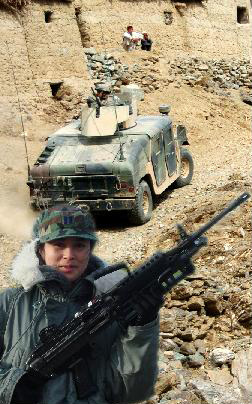 I underwent the same intensive training that every newly enlisted soldier must undergo, especially for Afghanistan deployment. 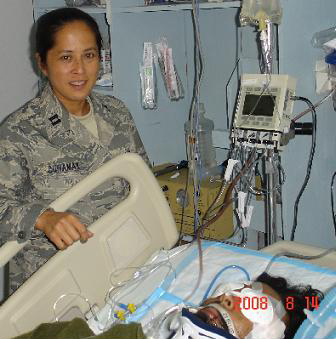 I work as an ICU nurse but also perform other duties as an Airforce officer. I wear the same uniform (ABU) like other U.S. servicemen assigned here, and we also we also salute to our higher ranking officers. I am at the forward operating base of the Army known as FOB Salerno located at Khowst Province about 12 miles from the border of Pakistan. We provide care not only for our soldiers but also local nationals (Afghans) injured in ambushes, bomb, land mines, accidents or burnt injuries. Burnt victims are quite common because there is no electricity and villagers used gas lamps and gas stove for cooking. Nearly every week rockets are fired in our base coming from the Taliban especially during full moon, but rarely hitting their targets, because they were always in a hurry. The Taliban have planted IEDs on the roads in nearby villages, sometimes hitting our own vehicles. Most victims are Afghans civilians, and we see mangled bodies, severe eye injuries, head injuries, and severed limbs. It’s really horrifying sights but you get used to it because of the frequency of its occurrence. Family members who visit or keep watch on a patient at the hospital are all males, a male relative, a brother or father. Injured U.S. servicemen are flown immediately to Bagram Airbase for transfer to Germany, then to the U.S. They don’t stay long at our hospital after surgery, they are flown by chopper to an airbase and flown by plane to its destination for a follow up care. 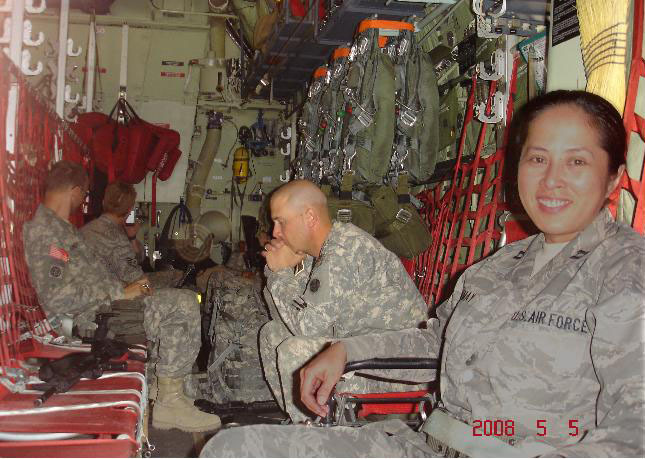 I had flown with patients twice with full body armor and a weapon. For U.S. servicemen everything is free – for all 33,000 of us here, our pantry looks like a Ralphs, we have unlimited drinks, except alcohol. I always carry a 9M anywhere I go, except to the shower or to the gym. I cannot leave the base. Last Aug. 18th, three suicide bombers blew themselves in out gate, one killed more than 10 villagers on their way to work . That same night we were attacked by 15 suicide bombers but thanks to the army, no damage was done inside the base. Busy is an understatement when we have to take care of more than 20 patients with shrapnel wounds. Rocket attacks are common in our other bases some worse than others, kiling sometimes contract workers. The price of freedom is high. Things we take for granted most of the time. Everyday someone dies out there and knowing we nurses can be of service to them give a new meaning to this profession. Despite the emotional scars of nursing young soldiers and Afghan civilians blasted by bombs and weaponry, I would have no hesitation returning to Afghanistan. Service to our soldiers is a calling I cannot turn my back.